Mechanical, Instrumentation discipline at Haldia Refinery, IOCL. 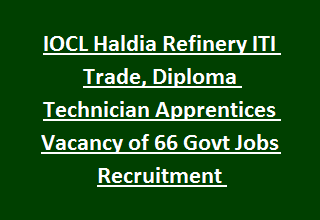 Total vacancies available in IOCL Haldia Refinery Recruitment are 66 posts. Interested candidates with specific qualifications may apply for this IOCL Apprentices Jobs using the official website @ www.iocl.com. Open the recruitment link and apply for specific post. Application submission through online starts from 28-October-2017. Last date for submission of IOCL application form is 11-November-2017. Monthly salary for the candidates selected for this IOCL Apprentices Jobs is Rs. 2500/- towards Conveyance, Stationery, Miscellaneous and other allowances. Applicants applying for the latest recruitment jobs will be selected on the basis of marks obtained in written test and Personal Interview. More details of Indian Oil Corporation Limited IOCL Technician Apprentices, Trade Apprentices (Fitter Mechanical/ Electrical/ Instrumentation) Recruitment Important dates, Vacancy details, Eligibility Criteria, Age limits, Pay scale, Selection process, Application Procedure are stated below. Total available vacancies in IOCL Haldia Refinery Recruitment are 66 posts. a. Trade Apprentice/ Attendant Operator (Chemical Plant): 15 posts. b. Trade Apprentice- Fitter (Mechanical): 03 posts. c. Trade Apprentice- Boiler (Mechanical): 08 posts. d. Technician Apprentice (Chemical): 15 posts. d. Technician Apprentice (Mechanical): 10 posts. e. Technician Apprentice (Electrical): 10 posts. f. Technician Apprentice (Instrumentation): 05 posts. Monthly Pay scale for all Apprentices Jobs is Rs. 2500/- towards Miscellaneous, Stationery, Conveyance and other allowances. Age of the candidate for IOCL Apprentices Jobs is 18 to 24 years. Upper Age will be relaxed for reserved candidates as per IOCL Govt rules. Technician Apprentice: Diploma (3 years) in Instrumentation/ Refinery & Petrochemicals/ Electrical/ Chemical/ Instrumentation & Control/ Mechanical/Instrumentation & Electronics Engineering discipline. Trade Apprentices/ Attendant Operator: Three Years BSc degree in Physics/ Chemistry/ Ind Chem/ Mathematics discipline. Applicants will be selected for IOCL Apprentices Jobs is based on their performance in written test and Personal Interview. Interested candidates have to apply for Apprentices Jobs may go through the IOCL official website @ www.iocl.com. Read the guidelines from IOCL advertisement before filling the application. Application submission starts from 28-October-2017. and ends on 11-November-2017. Last date to reach the hard copy of application form with necessary documents is 18-November-2017.